Professor Tim W. Dornis (Leuphana Law School) has authored a book on trademark and unfair competition conflicts that has been released by Cambridge University Press a few weeks ago. With the rise of internet marketing and e-commerce around the world, international and cross-border conflicts in trademark and unfair competition law have become increasingly important. 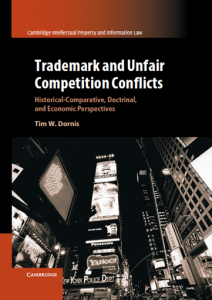 In this groundbreaking work, Tim Dornis – who, in addition to his scholarly pursuits, has worked as an attorney, a public prosecutor, and a judge, giving him experience in both civil and common-law jurisdictions – presents the historical-comparative, doctrinal, and economic aspects of trademark and unfair competition conflicts law. The book should be read by any scholar or practitioner interested in the international aspects of intellectual property generally, and trademark and unfair competition law specifically. This title is available as Open Access.